There have been qualms about Senator Miriam Defensor Santiago's presidential candidacy because of her perceived unstable health, despite her claim that we need not worry. The feisty 70-year-old senator has since gotten her campaign ball rolling, and even came through during the first Comelec-sanctioned presidential debate in 24 years, PiliPinas Debates 2016. 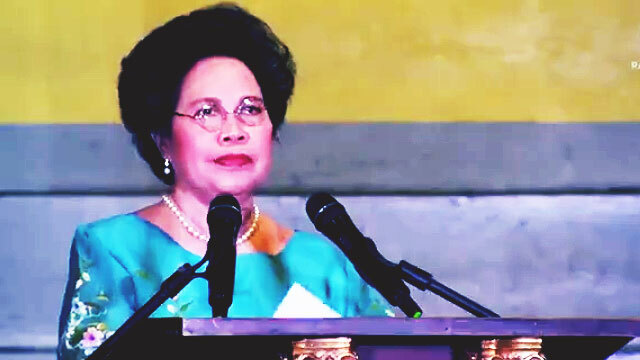 Her usual sharpness may seem lacking, but Miriam's arguments packed the same old punch she is known for. Not to mention the emergence of her short-lived "love team" with rival Davao City Mayor Rodrigo Duterte. Carrying on with her campaign trail, she continues to disprove her doubters. During a recent sortie in Laguna, Miriam was on top of her game, sounding off punchlines via her new "millennial" persona, which she started adopting when she was promoting her books a couple of years ago.